BGZ Studios is a small outfit based in Atlanta that, aside from regular photography work, also does a ton of cosplay stuff. 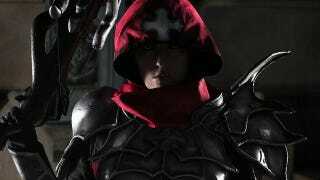 Like these Diablo III Demon Hunter pics, which are just great. I love the costumes, sure, and the images themselves, but what I actually like most is the "behind the scenes" look at the photos being taken. Cosplay photos can sometimes be taken for granted when scrolling around on the internet all day, but there's a ton of work that goes into making them, not just on the part of the actual cosplayers and costume builders but the photographers as well. You can see more of BGZ's cosplay work at the studio's website.